Many parents ask us about books that help children and teens with their emotions. I have the better half of Amazon’s Self-Help section on my bookshelf, and while working with this my clients, I get a good idea of which books make an impact. Here are a few of my favorites that can help your adolescent gain skills for managing emotions, communicating with others, and feeling their best. The Stress Reduction Workbook for Teens: Mindfulness Skills to Help You Deal with Stress (Instant Help Solutions) by Gina Biegel MA LMFT. This is a great workbook and can be used with some young ones too. Skills for understanding how stress impacts their body and their minds, as well as simple tools and exercises makes it a hit with my clients. 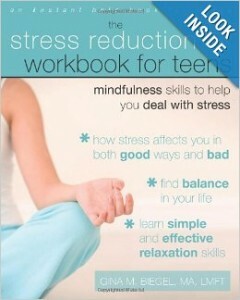 I love the idea that they are educating youngsters about the science and providing them with skills to change their responses to stress. Something that we rarely get in the classroom, this book is highly recommended by some of my adolescent clients (and it helped me, their therapist too). 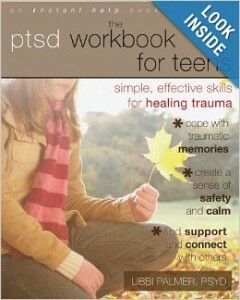 The PTSD Workbook for Teens: Simple, Effective Skills for Healing Trauma (Instant Help Book for Teens) by Libbi Palmer PsyD. Whether trauma was experienced at birth or last year, this book helps tweens and teens understand what PTSD is and how they can feel better. One teenager said this was helpful for her because it showed her that the symptoms she was experiencing were not uncommon. The adolescent-friendly language helps to engage readers in learning about tough topics. This is a great book for both boys and girls. 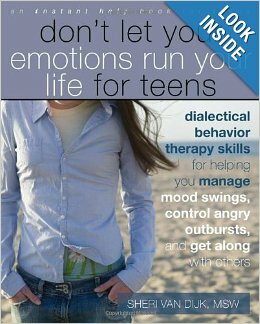 Don’t Let Your Emotions Run Your Life for Teens: Dialectical Behavior Therapy Skills for Helping You Manage Mood Swings, Control Angry Outbursts, and Get Along with Others by Sheri Van Dijk MSW. This is a great resource for both boys and girls. It teaches readers about being mindful and challenge intense emotions and urges with DBT skills, as well as practical interventions for long-term change. I often use some of their ideas in groups with teen girls. There are lots of up-to-date situations that cause most of our kids to feel anxious, fearful, frustrated and upset, and this book provides solutions. 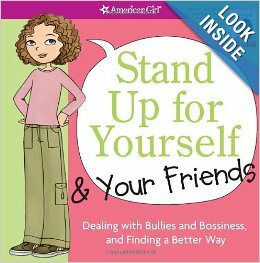 Stand Up for Yourself and Your Friends: Dealing with Bullies and Bossiness and Finding a Better Way by Patti Kelley Criswell and Angela Martini. Although this book is girl-friendly the ideas are invaluable. Young adults can relate to the situations all the time and it teaches girls quick and effective ways to feel confident especially social situations that cause stress. Share your favorite tween and teen books with us to help others! Happy reading everyone!